Pakistan is a country that never remained behind when it comes to the question for talent. The youth has exhibited its talent and competency many times in the past and continuing doing so. 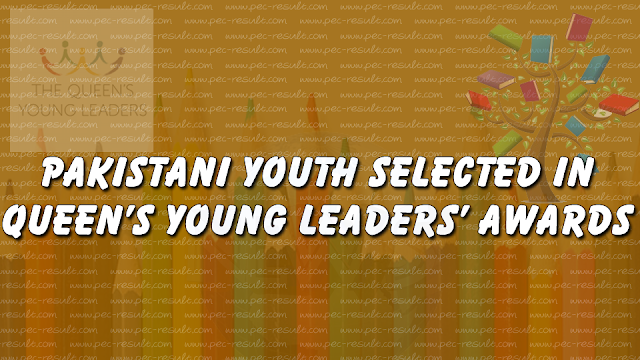 Same case has been seen again, as two Pakistani youth members, have been selected for Queen’s young leaders’ award. The awards will be given in a ceremony, which shall be held at palace on the days of queen’s 90th birthday. Muhammad Usman, a 28 years old boy from Punjab is selected on the basis of his thirst to provide education to all. Actually he designed a project “Back to Life Edutainment for Street Children” which he started on social media and successfully inspired 500 youth from all over the country to voluntarily implement the project in four major cities. The second award winner is Zainab bibi, a Pakistani 26 year old female who is selected for her work to use utilized tissue papers for bio diesel. The participants from all over the commonwealth states applied for the award and after rigorous selection process, these two have been selected among other pool of selectees. Total 60 young people will be given the awards that are taking the lead in changing the lives and inducing impression on the communities. Usman and Zainab will join other winners from 45 other commonwealth states and will be honored in London for five days. Muhammad Usman, while taking to a media said that he is super excited for the residential week in look under the queen young leaders programs which according to him, is an important opportunity to learn and share ideas and experience. Zainab said as the time for the departure is getting closer, her excitement to meet the queen in Buckingham palace is rising and she has no words to express her feelings for the week that will be best of his life. She also said that she is selected due to her work for the green energy and in her project; she developed bio ethanol from used tissue papers. The winners for the queen young leader award are from 18 to 29 years of age group and from various common wealth countries. All the participants are working on different social project from climate change to education, gender equality, mental health and disability equality. Pakistani government should also encourage the youth for such innovative idea and some kind of national award would be an excellent option to strengthen this culture. These two youth members need to be praised at national level and media should also enlighten their role so that other can get inspiration from them.